On the Road with Del & Louise officially released on Tuesday of this week—Tuesday, September 15—and what a week it’s already been! Both the paperback edition and the Kindle edition of the book have been hovering in various spots in Amazon’s top 10 new releases in mystery anthologies (in good company with various versions of Sarah Weinman’s landmark Women Crime Writers collection); I’m keeping fingers crossed for a festive launch party tomorrow (Saturday, September 19) at One More Page Books in Arlington, VA; and in the meantime, I’ve been completely spoiled by friends and supporters interviewing me, inviting me for guest posts at various blogs, and generally sending well wishes my way. As I’ve said before, I’m fortunate beyond belief in so many ways. I’ve been thanking folks already on Facebook and Twitter, but just wanted to give a quick round of thanks here to all the folks who made my first release week such a joy. Thanks to Dana King for interviewing me at One Bite at a Time—a terrific blog, with a great track record of interviews. Thanks to J. Kingston Pierce for a very extensive interview that ran in two parts: at Kirkus Reviews and at The Rap Sheet. Thanks to the folks at Henery Press for hosting me on the new Club Hen House blog—talking about road trips as inspiration for crime writing (and other kinds of writing too, I’m sure). Thanks to Catriona McPherson for inviting me to talk about writing from a woman’s perspective at Femmes Fatales. Thanks to Deborah Kalb for interviewing me at her Book Q&As blog. Thanks to Dru Ann for inviting Del to speak (finally!) at Dru’s Book Musings—such a fun chance to bring his voice and perspectives to the forefront. Thanks to Tim Peterson and the Burke Connection for a fine feature quoting some folks near and dear to me about my work. 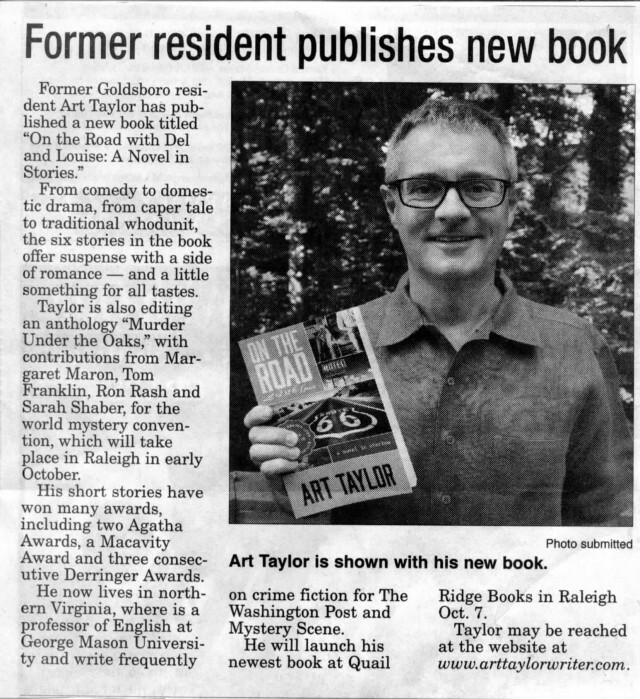 And thanks to the Goldsboro News-Argus in Goldsboro, NC, for featuring my book in a nice write-up that also looks toward my NC book launch at Quail Ridge Books on Wednesday, October 7—the eve of this year’s Bouchercon! And for anyone in the Northern Virginia, DC, Maryland area, I do hope that you’ll come our for the book launch on Saturday, September 19, at 5 p.m. at One More Page Books in Arlington. Here are details. Hope to see you there! Launch Party! A Picture’s Worth A Thousand Words?